Popular and proven advertising wall. Simple and fast assembly and disassembly. The complete system fits well within the trunk on wheels - included as set. PopUp SET is a very popular conference wall. Printing and all other equipment will fit in a plastic transport trunk on wheels. 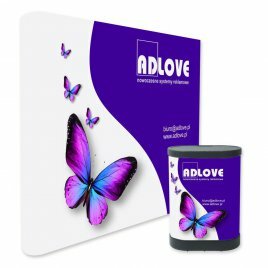 Our PopUp wall SET is a magnetic version, which means that the panels with graphics are attached to the structure by means of strips of magnets and magnetic tape. No mounting elements are visible from the front of the graphics. As an option we offer halogen lighting.